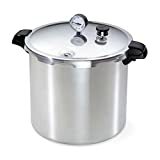 If you are an avid producer of home preserves, jellies and other foods, then you need a decent quality pressure canner to help you can your preserves safely. There are so many different pressure canners on the market of varying sizes (and prices), it is hard to choose. We've selected the ones that are large enough to allow you do to a decent batch of canning but are not too pricey. This is my top recommendation. 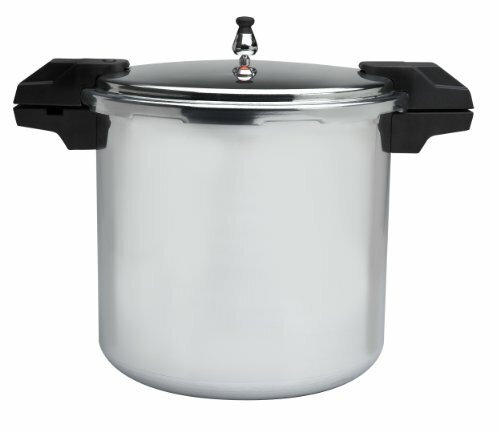 Presto invented household pressure canners, and this 23 quart canner is substantial enough to meet your preserving needs (and it doubles as a pressure cooker too). It comes with a rack so you can keep the jars off the bottom of the canner (so the hot water can get under the jars. It can do about 7 quarts at a time when canning jars. (The 23 quart liquid capacity takes into account the hot water as well). It has an easy to read pressure gauge and comes with an instruction booklet on exactly how to can each type of food. The price is pretty good too - see right, they are throwing in free shipping too! This pressure canner is slightly smaller than the Presto, but they say it can hold 7 quarts of jars. It is made in the USA of hand cast aluminum. It doesn't use gaskets - instead it uses a unique metal to metal sealing technique - this is part of the reason this canner lasts so long. It comes with two canning racks and a pressure gauge, plus a weight that jiggles on top. It also doubles as a pressure cooker. This pressure canner is by T-Fal and they advise it can hold 5 quart jars, but on further reading they seem to mean 5 liter jars - liters are bigger than pints. This canner also has the weight jiggler at the top, and a side gasket pressure release. It has a stay cool locking handle that will not release till the pressure has dropped. It comes with two canning racks and a 10 year limited warranty. This canner also doubles as a pressure cooker. If you make home-made preserves, jams, jellies and pickles, the US Department of Agriculture recommends that you use pressure canning to destroy the types of bacteria that can grow in a sealed environment (such as botulism). The spores in bolutism can survive boiling water (212F or 100C), but cannot survive at the higher temperatures produced by pressure canners (240F to 250F or 121C). Low acid foods, such as meat, poultry, most vegetables (e.g. cabbage) and fruits such as figs are particularly prone to botulism, and are best canned in a pressure canner. Acidity does tend to destroy botulism spores, but to be safe you can use pressure canners to can tomatoes, lemons and oranges as well, you just use it for a shorter time than when canning the low acid foods. Some foods such as pesto, oils, pumpkin puree, have such a low amount of acid that they need higher temperatures than 250F to can them - you cannot can these at home, they need a commercial canner. 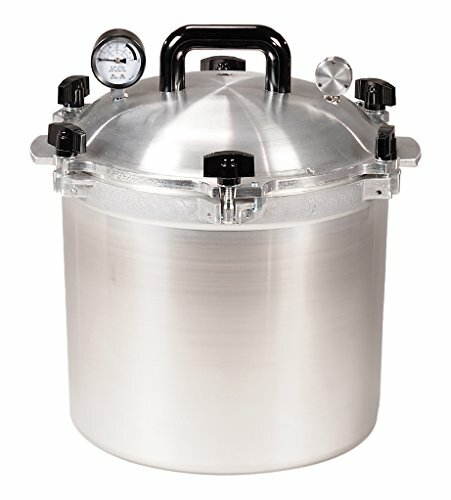 I believe pressure canners are the best choice for anyone that cans everything from tomatoes to jelly, jam and meats. By simply adjusting the ammount of time the low or high acid foods spend in the pressure cannner, is all a cook needs to worry about. For instance 15-min for pickles, and 30-mins for tomato sause or home made salsa. 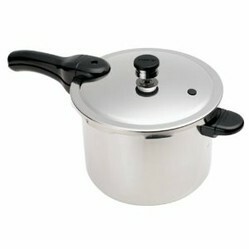 Eat better, can all fresh fruits, vegies and yes you can, can meats, soups and stews using a pressure canner.